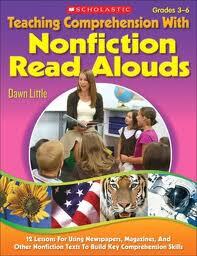 I’m linking to Allyson Beecher’s Nonfiction Picture Book Wednesday at Kid Lit Frenzy today. George loved words. But, he was unable to read or attend school because George was enslaved. Through sheer determination, he learned the alphabet, then he taught himself to read. George created poems in his head and recited them at a nearby college campus while selling fruits and vegetables for his master. Soon, the students on campus were buying his poems! But, would George ever by a free man? Check out Picture This! Teaching with Picture Books for my thoughts on how to use this in the classroom. The story of Hiawatha and the Peacemaker was passed down to the author as part of the North American Indian oral tradition. Hiawatha is a brave Mohawk warrior who has lost his family in battle and wants revenge against the evil Chief, who is inciting fighting among the five Iroquois tribes. When the Peacemaker (prophet) appears one day to unite the warring tribes, he uses Hiawatha to communicate his message. This message of peace not only changed the way the Iroquois governed themselves, but also acted as a blueprint of democracy that would later inspire the authors of the U.S. Constitution. Disclosure: I received copies of these books from the publishers for review.